John Porcellino has been publishing his King-Cat Comics & Stories mini-comics for 25 years, but I managed not to check them out until last month. BIG mistake on my part! Turns out the critics were right; John P.’s one of the best autobio cartoonists out there, as well as “a master at miniature poignance” (Entertainment Weekly). 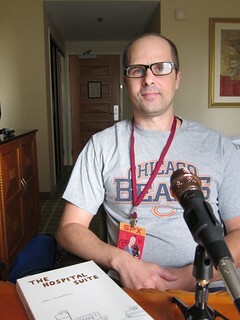 We sat down at SPX 2014 to talk about publishing his new work, The Hospital Suite , as a standalone book and developing the skill and courage to tackle longer stories, his disdain for “the culture of like”, overcoming the shame and stigma of his OCD, the process of discovering an audience for his work, the pitfalls of autobiographical comics, discovering the power of negative space, turning his life into a narrative, how comics enabled him to communicate with people, and, most importantly, being an NFL bigamist. Give it a listen! Bonus: Roger Langridge gives us a few minutes at SPX to talk about his new book, Jim Henson’s The Musical Monsters of Turkey Hollow ! John Porcellino was born in Chicago in 1968, and began drawing and writing at an early age, compiling his work into handmade booklets. His acclaimed self-published zine, King-Cat Comics and Stories, begun in 1989, has found a devoted worldwide audience and is one of the most influential comics of the past 25 years. His newest book is The Hospital Suite , and he is the subject of a new documentary, Root Hog or Die. His work has been collected in several editions, including King-Cat Classix , Map of My Heart , Perfect Example , and Diary of a Mosquito Abatement Man . He is also the author of Thoreau at Walden and The Next Day: A Graphic Novella . Credits: This episode’s music is Theater is the Life of You by The Minutement (John’s a fan). The conversation was recorded at the Bethesda North Marriott Hotel on a pair of Blue enCORE 200 microphones feeding into a Zoom H5 digital recorder. The intro and outro were recorded on a Blue Yeti USB Microphone . Processing was done in Audacity and Garage Band. Photo of Mr. Porcellino by me.